This is Big Agnes' last adventure. Of course, I said that last year too. Mesh tents: not advised for winter camping, but whatever. This is the tent Bart and I lived in for five months and will use for five weeks this summer. It is a Big Agnes Seedhouse SL2. I bought it in 2009 with my hiking buddy Phil. We still share custody of this tent, but I think I've done more to destroy it than he ever has. Sorry Phil. Seedhouse SL2 is not the lightest on the market, weighing just over 3 pounds, but it is freestanding and easy to set up - under 90 seconds. For 3 pounds, you get a lot of tent. The mesh is my favorite part; I have watched bears, stars, and mosquitoes all from the comfort of the tent. The rainfly is only necessary in cold or wet weather. Taking over the entire two-person tent. . . it is very easy. As you can see, a two-person tent means that although you can fit two people into the tent, you gotta like each other. In the winter it was nice because the small living space kept the temperature significantly warmer. In the summer the rainfly is usually off, keeping the tent cool. -Zipper. Big thanks to my dad, who operated on the tent's zipper and thus extended the tent's life one more time. -The rainfly. On a rainy night in the Smokies, Fiskars and I realized that the rainfly was no longer waterproof. At all. I called Big Agnes Customer Service the next day and by the time we reached our next town stop, a new rainfly was waiting for us. They gave me a discount and sent me stickers too. My allegiance is easily won with stickers. -The floor. The floor really feels like it's worn thin, and its waterproofness is all but gone. Bart sprayed the tent with some waterproofing stuff and that helped. Really, I think the floor is just shot (how could it not be?). This could have been delayed by using a ground cloth more diligently. The fact that this tent is still usable and without any gaping holes after all the hell it has been through is proof that Big Agnes is a solid brand. I got really lucky to find a tent I like so much. I even own the 1-person version of Seedhouse. The Big Agnes website says this tent is like a "peanut butter and jelly sandwich," and they nailed it. 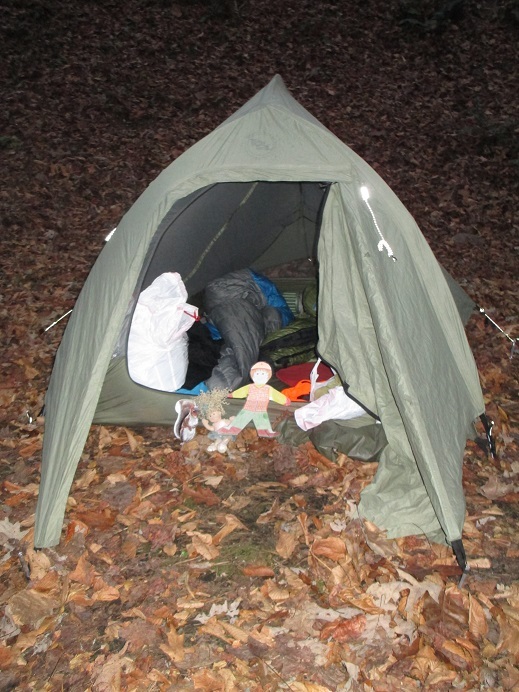 When you choose a backpacking tent, weight is really important. That being said, there are tons of lightweight options that I would never choose - just my own preferences. Many people get by with a tarp. I need to be enclosed or I can't sleep well. For me, it is worth extra weight to carry an actual tent. Hammocks are gaining in popularity, but I have a terrible relationship with gravity so I wouldn't consider one. I hear great things. Try on as many tents as possible before you buy. Set them up. Climb inside. Take them down. Annoy the people who work at the store (actually they are probably used to it). You'll be glad you did: this is your second home you're purchasing, so be choosy.